Maggie organized her entire birthday party this year, making it super simple for this Momma. Who knew that eleven would be such a turning point? Hooray! First, she decided what cake she wanted, and baked it herself. Chocolate cake with chocolate icing and “happy b-day” written out in M&Ms. Next, she requested a simple goody gift to give her friends. Pretty candies from our local sweet shop, bagged in clear plastic & tied with festive purple & red ribbons. Not to many candies since Halloween is just around the corner & she knew they’d all be OD’d on sweets soon enough. Finally, she planned out the activities for the afternoon. Her time-line went like this: 1st hour Outdoor Olympics. 2nd was cake, pink lemonade & presents. 3rd was RockBand on Wii — what she didn’t know was we’d bought her the Beatles game that’s just come out so this part was full of extra unexpected excitement. Hop all around the house on one foot. If you switch feet you will be disqualified. Head-toss black walnuts. (yeh, you read that right). Place a walnut on your head and throw it (not too hard or it will hurt). The person who tosses their nut the farthest, wins. 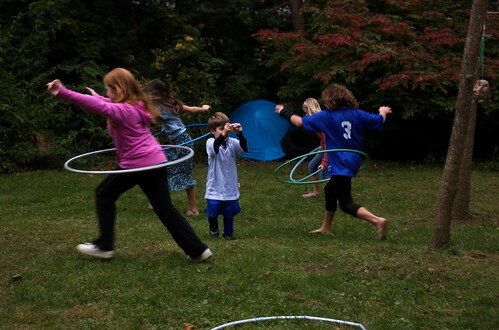 Hula-hoop race. Mark out your race start & end spot. Whoever can hula-hoop all the way to the finish line first without dropping their hoop, wins. High jump. Two people hold opposite ends of a jump rope & the party goers take turns jumping over it. Raise the rope a bit higher until you have just one contestant left & you have a winner. Blind-man’s walnut hunt. Pair up your contestants into twos. One will be the guide & the other will be blindfolded. The blindfolded person has to gather as many walnuts from around the garden as they can in ten minutes (we didn’t actually time this). The guide is only allowed to speak, giving directions to help his partner find the nuts. I was particularly happy about these Olympics because I’ve been planning to gather our walnuts to dry them since we have four Black Walnut trees, and I’ve been told the nuts are both edible & delicious. Did I ever tell you about Iceland? © 2019 Little Elephants. All rights reserved.